The Philippines was colonized by Spain centuries ago, and Spain has influenced Filipino culture profoundly. Spanish tales of valour and chivalry had captured the Filipino imagination and inspired Filipinos to create tales of valour of their own. These tales are usually told in the form of the korido and the awit – romances traditionally written with rhyme and meter, and sung to the accompaniment of a guitar. 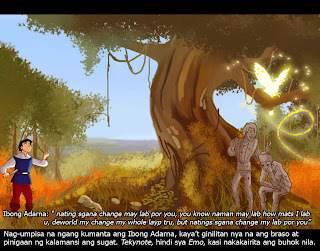 One of the best-known koridos in Filipino literature is, “Ibong Adarna: Corrido at Buhay na Pinagdaanan nang Tatlong Principeng Anac nang Haring Fernando at nang Reina Valeriana sa Cahariang Berbania.” (Translation: The Adarna Bird: Corrido and Life Lived by the Three Princes, Children of King Fernando and Queen Valeriana in the Kingdom of Berbania) written by Jose de la Cruz. He is also known as “Huseng Sisiw,” or Jose the chick (meaning “baby bird,” of course, not attractive woman!). The korido’s full title might say that the story is about three princes, but the real star of this story is Don Juan, youngest prince of the fictional Kingdom of Berbania. Unlike the Don Juan of Spanish myth, this hero is definitely more than just a ladies’ man – although naturally, he eventually gets the girl. He’s the Filipino metrical romance version of the Marvel superhero and Avenger, Thor: a favoured son constantly tormented by a jealous brother (or, in Juan’s case, two jealous brothers), who is sent off to distant realms at their father’s behest. Who is he? He’s the youngest Prince of Berbania and the most favoured son of Dona Valeriana and Don Fernando, monarchs of Berbania. At the end of the story, he returns to his lady-love’s realm to rule there as emperor. He fell in love with Princess Leonora on sight, but he forgot about her to search for the beautiful princesses of Reino de los Cristal. He instantly fell in love with Maria Blanca, the eldest of the three princesses, and he risked both her life and his to bear her away from her powerful father’s magical kingdom. When he returned to Berbania however, he completely forgot about Maria Blanca and fell in love with Leonora again. It was only after Maria Blanca invited herself to Juan and Leonora’s wedding that Don Juan remembered that he loved Maria Blanca. Several wise old men who advised him and aided him in his journeys; one of them turned out to be Jesus in disguise! He charmed Dona Maria Blanca with sweet words and humility – After stealing all of her clothes! She is actually an enchantress in bird form. Every night, she roosts in the tree of Piedras Platas on Mount Tabor, and sings seven songs. Her songs have soothing and healing powers, and they can either heal people, or put them to sleep. Her droppings can turn people to stone. When Don Pedro and Don Diego turned on their younger brother, beat him, and left him to return to their ailing father with the bird, the Adarna refused to sing. She only willingly sang to cure Don Fernando when Don Juan finally returned. After escaping the gilded cage that Don Fernando had built for her, the Adarna frequently appears to Don Juan to give him advice. She is the one who tells him about the daughters of King Salermo, urging him to journey to his kingdom to win their hand. What’s interesting about Don Juan is that towards the end of his story, it’s the damsel (Maria Blanca, white sorceress extraordinaire) who does most of the rescuing and decision-making. That doesn’t make Don Juan any less of a hero though; that just makes him a man who’s secure enough in his masculinity to be OK with the woman taking the lead! As with all songs and poems with rhyme and meter, this korido is best read aloud. As mentioned earlier Jose de la Cruz a.k.a. Huseng Sisiw is the writer of this Korido however, there are some who believe that Ibong Adarna was written by Francisco Baltazar (a.k.a. Francisco Balagtas), the author of another classic of Filipino folk literature, Florante at Laura. This is not true. Balagtas is said to have studied under Huseng Sisiw, and he is known to have written many other works, but Adarna is not one of them.